A court in Gaza on Wednesday sentenced eight members of the Fatah faction to lengthy jail terms for undermining "revolutionary unity", the Hamas-run interior ministry said. The men were found to have collected "security information" against Hamas, including on the "structure and movements" of its militants, in cases dating back to 2014, the ministry said in a statement. Three were jailed for life by the military court, while the rest received sentences ranging from seven to 15 years. They were members of the Fatah-led security services. Fayez Abu Eita, a spokesman for Fatah in the Gaza Strip, called the sentences "political and unjust". 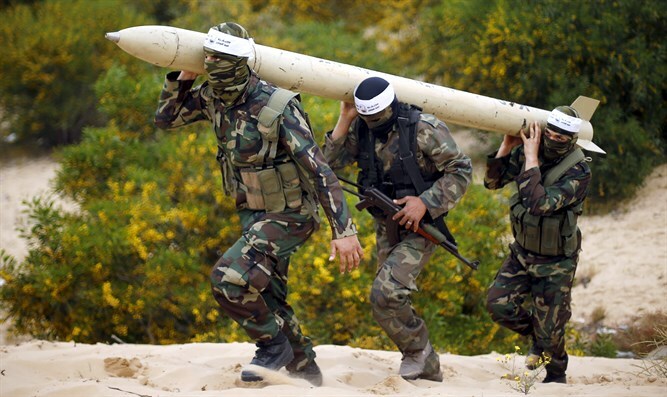 Hamas has run Gaza for a decade after forcing out Fatah in a near civil war. Fatah, however, still leads the Palestinian Authority in Judea and Samaria's areas A and B. A number of attempts at reconciliation between the two sides have failed. The Palestinian Authority security forces run by Fatah, regularly arrest Hamas members.